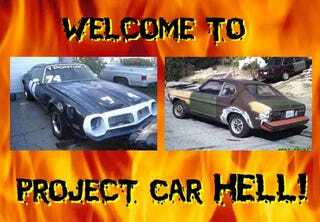 Project Car Hell, Woodless Woody Edition: Mercury or Ford? Man, Firebirds totally RAWWWK! (repeat several times in your best Cookie Monster voice for strongest effect, and if your coworkers object, why, then just flash the Devil Horns at 'em). Imagine thundering down the boulevard in a menacing 2nd-gen Firebird, complete with all the emblems, flares, tape stripes, and everything! You'll have to imagine pretty hard when this admittedly rough '74 Esprit is your starting point, of course, but look at the price: a righteous 500 dollahs! It has a "bored out" 400 (and, in a statement sure to grate like chalkboard fingernails to anyone who knows Pontiacs, it's a "big block" to boot!). It's got Flowmasters! It's got gigantic "74" emblems on every possible surface! On the minus side... well, it's hideous, plus there are some issues with the registration (the main one being that the seller has no paperwork whatsoever). It runs, though... well, it used to run, at least. Sure, classic Detroit muscle is really fun, but what if you're more into European-style sporty cars? You know, cars that don't tend to understeer into the nearest oak when you get a little to enthusiastic on the twisties? You can stay nominally American by going with this '73 Capri as your next project. It's $100 more than the Firebird, but it actually runs so you have to pay more. It was once a V6 car, but it's had a 1600cc 4-banger dropped in. Yes, that little demon on your shoulder is hissing "Nooooo... noooo... that car would be worse than eternal damnation!" but that's just because he's unable to look past the junkyard smörgåsbord of mismatched body parts to the inner beauty that lies within. You might have a couple decades months of body work to do, of course, and it's a dead certainty there's a chance that the electrical system will have some problems. But come on- think of the Capri's storied racing history!